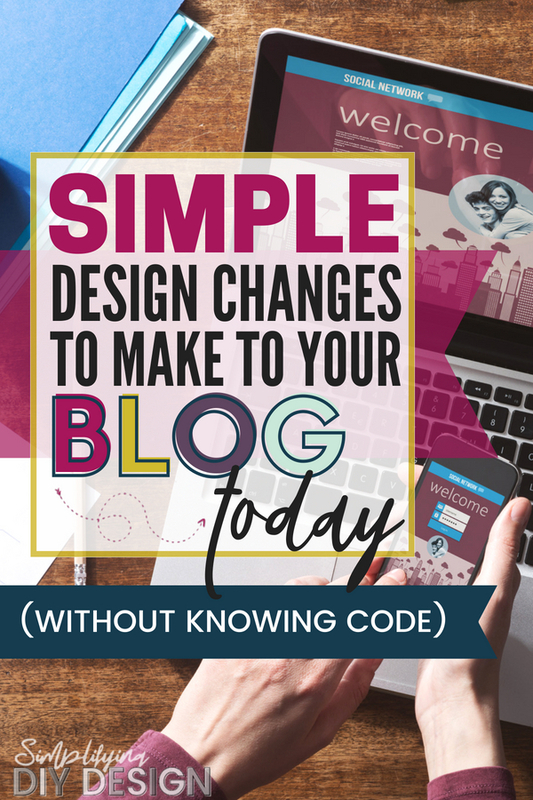 Design for Bloggers | Make These Simple Changes To Your Blog Today! I used to rock html code. I mean, seriously, I had the most decked out Myspace of ALL my friends. But then Facebook came around and I couldn’t customize the code (which I was super bummed about) so I just stopped doing it. Fast forward about 15 years (yikes) and now I’m a blogger and even though I have a certification in Graphic Design and can make a pretty mean Pin, I know nothing about code. So when I was setting up the foundation of my first blog (long before I could pay an amazing web designer like Laura from Pixel Me Designs who designed the theme for Simplifying DIY Design) I struggled. I found a theme I liked but I still thought it looked plain. I’m all about the visual elements. They matter! 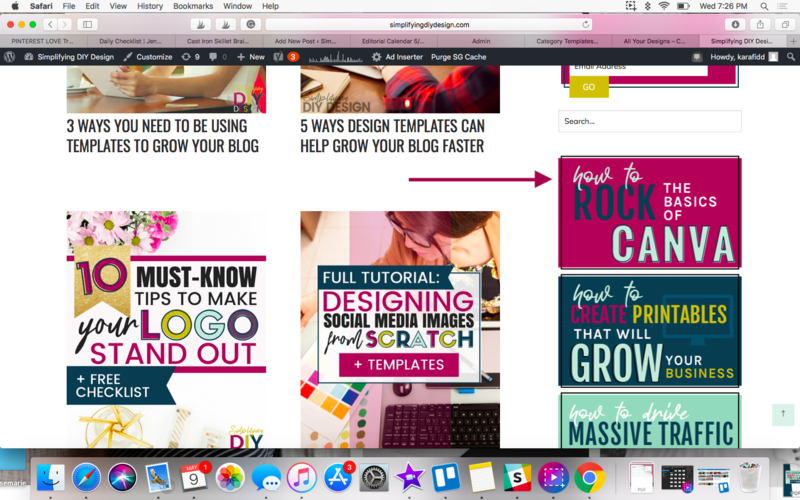 So I started revamping what I could, with the tools I had available at the time– Canva. Your logo is a great place to start since it’s the very first thing people see when they get to your blog. You don’t have to be a designer or have any kind of fancy program for this. 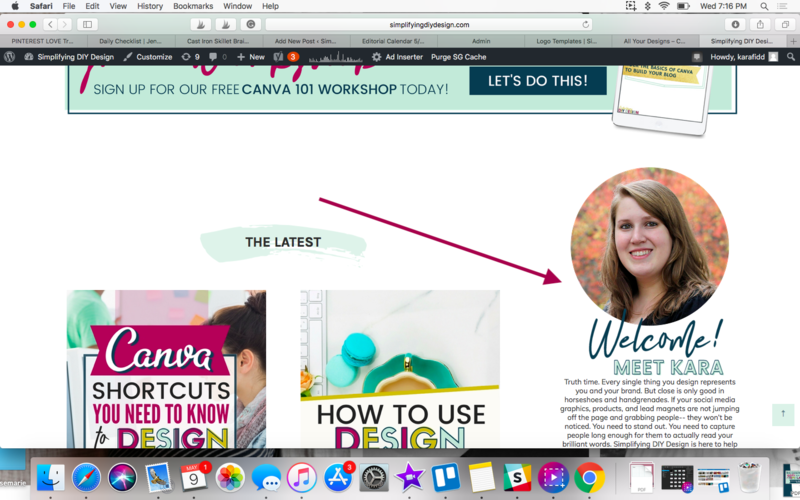 Canva is perfectly fine. Keep in mind that it is against Canva TOS (terms of service) to use any of their clipart in your logo. So, stick to text and possibly use shapes to add a little extra design element to your logo. Another alternative is checking out the clipart and graphic bundles available on Design Bundles or Creative Market— make sure the artwork is available in PNG format so you can upload it to Canva. Side note: If you haven’t already checked out our article containing all the details of creating a logo, you can do so here. Again, you don’t need to have a design background to rock your logo. Search through some examples of logos for inspiration, stick with your brand, or use a template. A decent logo design starts at $100 and goes up depending on the package. 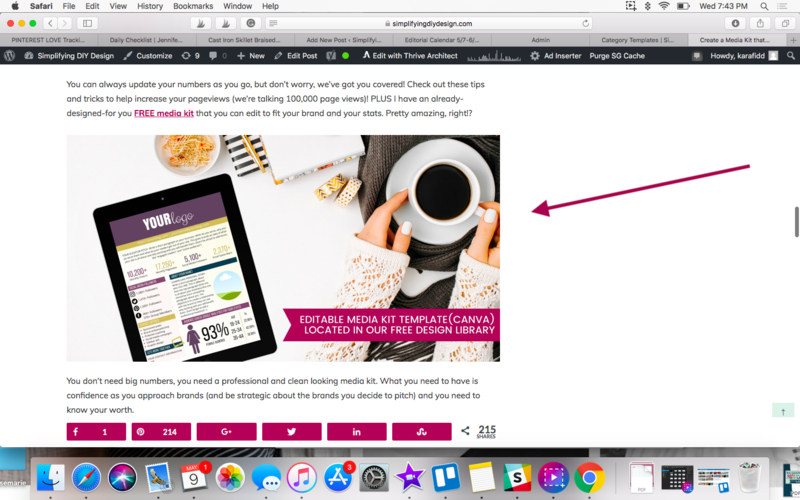 Using a template or designing one yourself is a great way to save money big time and can make a huge difference with the overall look to your blog! You’re “about me” graphics is a great way to add some design elements to your sidebar. It’s also a great way to draw people to your “about m”e page. The “about me” page is a great opportunity to tell people a little about who you are, a LOT about what’s in it for them and lead them into your offer (opt-in, product, or work with me opportunity). Again, you can easily do this in Canva. Simply use a circle frame, drag and drop your photo into it and then add some sort of greeting. Upload images into your sidebar without having to know ANY code by using the Simple Image Widget. Under the image will be a text area that lets you put in the link you’d like the image to go to, put in the link to the associated blog post. This won’t apply to every theme, but some of them allow you to use custom images for your categories. If your theme allows it, design some great images. It will not only lead people to click around your site, but it will also add to the overall design of the page. Popular post graphics are a GREAT way to get people to click around. Not only does it attract people to click on multiple posts (which is great for SEO) it is also a great way to lead people to your heavily monetized posts. You can also choose posts that funnel people into your email opt-in as well. This is a far better use of the sidebar than installing a “popular post” plugin that simply displays text links to posts that are most visited. Your actual “popular posts” aren’t necessarily your money-making posts! In addition, this is also a much better use of space in the sidebar than things like showing the categories or archives. Unfortunately, those things aren’t visually appealing and don’t do anything for click through. 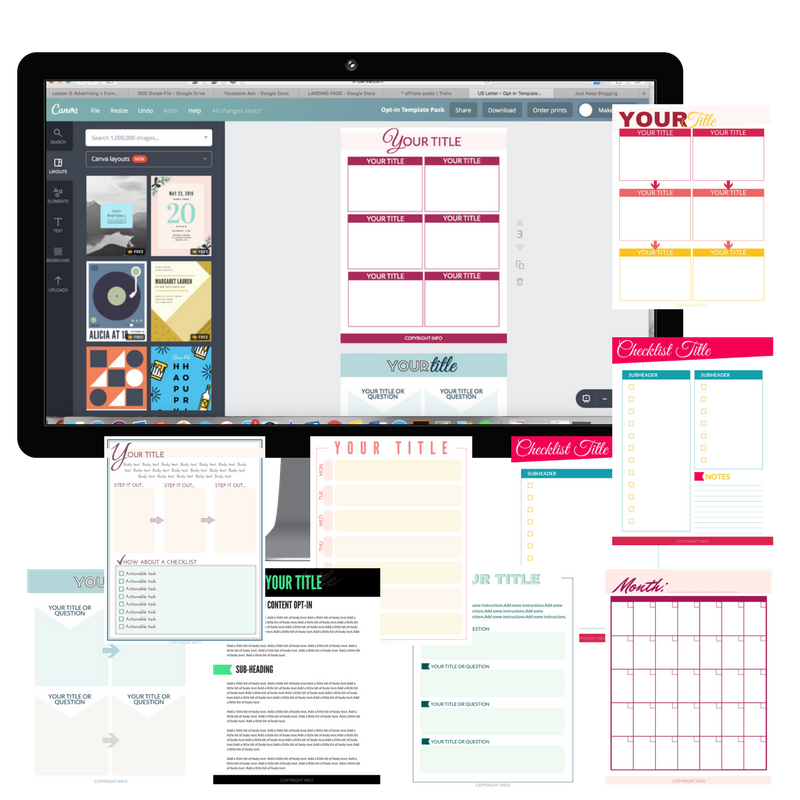 These also can be very easily designed using a program like Canva or by using a template. 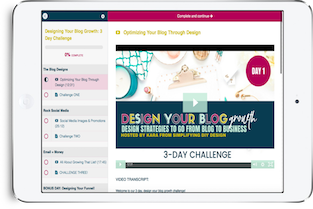 In fact, we even have a few sample popular post templates as part of our Design Your Blog Growth 3-Day Challenge. Lead magnets are a great way to showcase and give a little preview of your lead magnet. I generally include this graphic separate from the actual form. Usually, higher up in the blog post when I first mention the freebie (instead of having a million forms). I usually include the graphic and let them know that it is available at the end of the post. This is generally a simple mockup style graphic that (again) can be easily created in Canva using stock photos and a 3-cover maker or frames from Canva. I’ve said it before and I’ll say it again: the graphics matter. The style and the brand, all those things matter. If you don’t have things on your blog to draw your reader in it will be much more difficult to keep their attention. Kind of like a toddler looking at a book with no pictures. Pointless, right? You don’t need to start from scratch, you don’t need to redo everything you’ve already done. Simply optimize what you already have. You have the blog, you have the “about me” blurb, the content that you can create popular post graphics for, and the opt-ins. Now just optimize it by making it more visually appealing. You’ll be surprised at the difference a little graphic design can make. The thing is, you’ll always need graphic design. First, it’s the blog design. Then once you start trying to boost your traffic and grow your blog you’ll need the social media designs and the lead magnets. Then you’ll need to monetize and scale. Guess what? You’ll need to design products! Graphic design is going to be a part of your blogging career. Non-negotiable.